Check Out Compunetix at InfoComm 2012! Join us at InfoComm 2012 next week on June 13-15 at the Las Vegas Convention Center. Tens of thousands of audiovisual products and services from over 900 of the industry’s leading companies will be showcased at this year’s show. Attendees will have the opportunity to meet with these companies at their booths, or at workshops and meetings and acquire collaborative technology solutions and ideas. The Compunetix Video Systems Division (VSD) will be at booth N2218, so stop by and learn about all the functions and features of our EVERGREEN™ family of Multipoint Conferencing Units (MCUs)! Trusted as the most reliable and innovative systems on the market, the Compunetix EVERGREEN™ family provides superior video conferencing to meet the diverse needs of enterprise users, Conferencing Service Providers (CSPs), and government agencies. Backed by our longstanding reputation and expertise, the EVERGREEN™ Cedar, Cypress, and Sequoia systems provide feature-rich, high quality, reliable, and secure video conferencing. We will also be unveiling our Video on the Fly mobile solution, a high quality app available later this month from the Apple iTunes store! This new mobile solution connects with the EVERGREEN for enhanced mobility within the system and provides extensive interoperability, as it can be used on Apple iOS devices, such as the iPad, iPhone, and iPod, and is also available as a web browser video app for either a PC or Mac. The web browser avoids firewall traversal issues by using existing open and secure standard web ports. Our Video Systems Division (VSD) is also working on creating an Android app for Video on the Fly, to be available in the upcoming months. Video on the Fly seamlessly unites audio, video, and data streaming and can be branded to provide a client with a customized experience. Follow us on Twitter @CompunetixAudio and look for hashtags #InfoComm12, #VideoOnTheFly, and #VidFly for tweets about Compunetix at InfoComm before and during the week of the show. 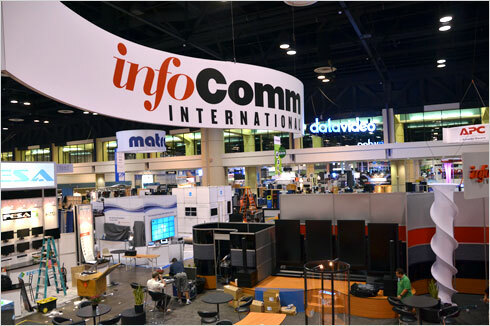 See you all at InfoComm 2012!